People love to watch video. Video platforms on Facebook, Snapchat and Instagram are powerful ways to capture your prospects’ attention and get them to respond to your offer. 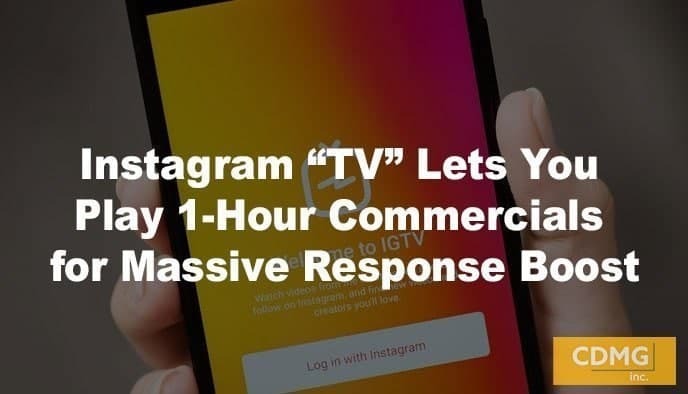 Now, Instagram has created a new platform called “Instagram TV” – allowing you to create videos that are anywhere from 10 minutes to 1 hour – like an infomercial – to advertise your product or service on your Instagram account. This is an amazing opportunity to generate new leads and get a boost in response. But in order to maximize response on Instagram, you’ll need to know certain keys to creating effective video content. For example, you’ve got to capture the attention of your viewers in the first 3 seconds of your video ad. Otherwise, they’ll click on to another video. And, your ad must follow the principles of direct response marketing: “You”-oriented copy, a clear call-to-action and stressing the benefits, not the features, of your offer. I also recommend on-screen text, and using a strong spokesperson to help sell your product or service. I’ve created over 300 videos, including 13 infomercials. I’ve written a list of rules to creating effective video here: 21 Critical Video Marketing Rules: How You Can Increase Your Response and Profitability. If you’d like to talk to me about how to use this powerful new Instagram strategy to boost your leads and sales, give me a call at (31)212-5727 or email Caleb at caleb@cdmginc.com.